With the royal wedding fast approaching, many of us wedding enthusiasts are speculating about and eager to feast our eyes on the beautiful Meghan Markle's wedding dress. Who is going to be the designer? Is it going to be understated and delicate? Will she opt for a train as long as the aisle? There are so many questions that we need answering! Well, luckily there isn’t too long to wait. To occupy us until Saturday, we are going to look back at a few of our favourite royal wedding dresses from years past. Looking back to 1840 to the wedding of Queen Victoria and Prince Albert, Queen Victoria’s wedding dress quickly became an icon in itself. Do you love the white wedding dress tradition? We have Queen Victoria to thank for that. At the time of their wedding, white wedding dresses were not common practice, and you were more likely to see a bride take to the aisle wearing a coloured wedding dress decorated with gold or silver embroidery. She also seized this opportunity to ban her wedding guests from wearing white, ensuring nobody would steal her limelight – as if that were possible! Queen Victoria’s wedding gown was designed by William Dyce and made by Mary Bettans. The royal wedding dress was made with a heavy silk satin spun at Spitalfields and adorned with an intricate Honiton lace from Devon - a dreamy combination. To accessorise, Queen Victoria wore a sapphire brooch, white satin shoes, Turkish diamond earrings and as opposed to the conventional crown, Queen Victoria fashioned a wreath made from myrtle and orange blossom… is Queen Victoria also responsible for the flower crowns we all know and love today?! Queen Victoria loved her wedding dress SO much, that she went on to wear the royal wedding gown a number of occasions, including in a posed anniversary portrait to Prince Albert, a serious of wedding enactment photos upon the advances in camera technology and also for her Diamond Jubilee portrait. Moving forward some years to 1947, we arrive at Queen Elizabeth’s wedding to Prince Philip. Norman Hartnell ensured there were no details overlooked in the designing of Queen Elizabeth’s wedding dress. Taking inspiration from Botticelli’s ‘Primavera’ painting, he designed one of the most exquisite royal dresses to date. Queen Elizabeth’s wedding dress was made from a luxurious ivory duchesse satin that was heavily yet elegantly decorated with an embroidered floral design, and sprinkled with tactically placed pearls. The Queen’s dress featured crystals, a fine silver thread and delicate applique. Queen Elizabeth also set a precedent with her breath-taking silk, tulle train that stretched an impressive 13-foot from her shoulders and boasted more intricate embroidery with pearls, crystals and applique. The dress certainly did all the talking and so Queen Elizabeth opted for simple accessories that complimented this beautiful dress perfectly. The Queen wore satin heeled shoes, a silk veil and pearl and silver buckles. It is clear to see that this classic royal wedding dress is still a heavy inspiration for today’s wedding dress styles and trends. Now we are in 1981, at the wedding of Lady Diana Spencer and Prince Charles and here is where we see one of the most iconic British royal wedding dresses of all time. To look at now, many people say the dress is not something they would wear themselves unlike the slightly safer choices of Kate and Queen Elizabeth, but at the time, Princess Diana’s dress was nothing short of spectacular and still to this day it was a talking point for sure. Princess Diana’s dress was designed by David and Elizabeth Emanuel who described it by saying: “had to be something that was going to go down in history, but also something that Diana loved” and that it had to be “…suitably dramatic in order to make an impression.” It is safe to say they achieved their goals. The bold and boisterous royal wedding dress was an ivory silk taffeta gown that was enhanced with ample antique lace. The stand-out royal gown was hand-decorated with sequins, over 10,000 pearls, embroidery and finished with an antique hand-made Carrickmacross lace, previously belonging to Queen Mary. Princess Diana’s wedding dress, now undoubtedly one of the most famous wedding dresses in the world, featured considerably large puffed sleeves and an astonishing 25-foot train, both of which are features that make Princess Diana’s dress one of the most easily recognisable. Regardless is Princess Diana’s dress suits your personal tastes, you cannot deny this this is one of the most iconic wedding dresses of all time. Now to the most recent high-profile royal wedding, the wedding of Kate Middleton and Prince William in April of 2011. Kate Middleton’s wedding dress was intricate and fairly understated when compared to previous royal wedding dresses, by it was certainly no less extraordinary. 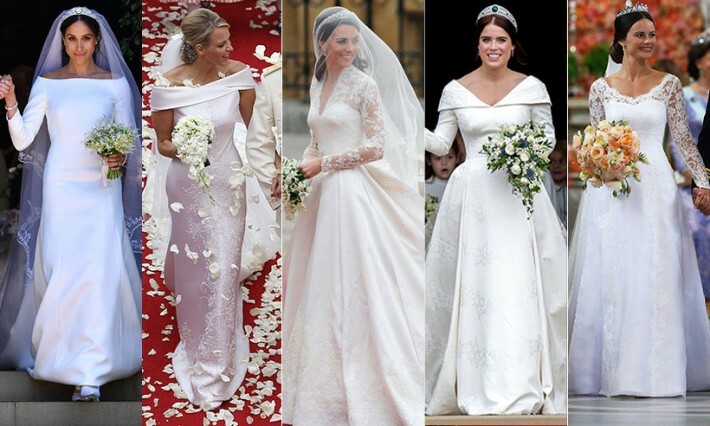 The wedding dress of Kate Middleton was designed by a familiar British fashion designer, Alexander McQueen, although this was confidentially kept under wraps until Kate arrived at Westminster Abbey for the service. The dainty royal wedding gown was an amalgamation of classic with a modern twist and it is believed Kate was heavily involved with the design process. The wedding dress combined an ivory satin bodice, inspired by Victorian corsetry, and embellished with machine-cut lace motifs and 58 gazar and organza buttons to the back. The skirt was long and full to represent the opening of a flower, featured soft pleats and fanned into a modest three metre train. The skirt, underskirt and bridal train featured a similar lace applique to that on the bodice of the dress and the main body of the dress was constructed with ivory and white satin gazar. It is believed the dress was inspired by Grace Kelly’s 1956 wedding dress, but Kate Middleton’s wedding dress is now an inspirational piece in its own right to brides and bride-to-be’s around the world. Speculation is rife around Meghan Markle’s wedding dress. We do not know which designer has the honour of creating Meghan’s wedding dress, nor do we have idea which route Meghan Markle will choose to take for her own royal wedding moment. But whatever it is, we know she is going to be one stunning bride! Which British royal wedding dress is your favourite? Mi Amor admires them all for their own unique qualities and impact each of them have had on wedding dresses and wedding fashion. Whatever your style is, Mi Amor Bridal’s wedding dresses cover all tastes from traditional and modern, classic and unusual, flowy and airy or structured and bold. To book your personal appointment at our wedding boutique, complete our online contact form today and one of our bridal consultants will be in touch with you.